← Miss Hathoway- IN HERE NOW!!!! First- thanks to all of you for checking in to see how the Clampitts are faring in the face of this Earthquake. I’m certainly not CNN, however, here’s the situation from Shibuya-ku. Spouse is in Osaka- he’s usually gone for major snowstorms, earthquakes, pet emergencies, etc. The kids experienced this first earthquake at school and are currently en route home- a journey that has been underway for the last 4.5 hours as the highways are currently jammed. For us, it started about 2:30 in the afternoon. I was at the grocery store perusing the narrow aisles, gazing absent-mindedly at syrup,” Breakfast for dinner?” when the boxes started to fall on me as if that was a such a good idea they just jumped on down of their own accord. I hurdled the next three Japanese women in my race to be the first out of the store. I heard the wine crashing to the ground on my way out. I stopped in the middle of the street as all the other people flooded out of the buildings. A man and I looked each other in the eyes as he stood holding on to a swaying telephone pole. Where were my kids? The pole covered a distance of 5 to 6 feet, back and forth. I looked up to see if it would hit me when it fell. The street was narrow- where was I safest? Under one of the building overhangs or lying buried in its rubble? I decided to run for the intersection where there was more space. The Japanese, used to earthquakes, were now starting to panic as the intensity of the earthquake grew. They began to hold each other. Some were starting to cry. The ground was swaying enough to when I moved I lost my footing. Or was it because I was still holding a death grip on my shopping cart? Good thing I brought that along- could I crawl under it? Where were my kids? It lasted forever. Plants started to fall off balconies, cars started moving, bikes fell, the vending machines were toppling over. People were frozen. All was silent except for the sounds of the buildings shaking. Creaking. Squeaking. We all stood rooted to our spot, unmoving, except for our eyes, darting quickly to each building, wondering which one was going to fall on us, all the time evaluating if we would see it in time to run. Was this our time? Where in the HELL was my family? It stopped. The collection looked at each other. We were alive and the buildings around us were standing. I walked back to the grocery store. The young grocery clerk was crying. I put my arm around her. I talked to her in English. A Japanese woman came over and took her from me. I wished she were my daughter. Broken bottles lay smashed all over the floor. A woman scrubbed tomato sauce with her hands. My phone didn’t work. I tried to text. That didn’t work. It was quiet. No one was talking. Hundreds of people were lining a tiny street but no one said a word. The subways were closing. People poured out of the hole where the subway belonged. An aftershock. People grabbed each other. I walked home. I didn’t know what was happening. I couldn’t understand the announcements- but- the buildings were standing. No fires. No panic. No blood. In the Ouiser hierarchy of panic situations, I chalked this all up as positive. 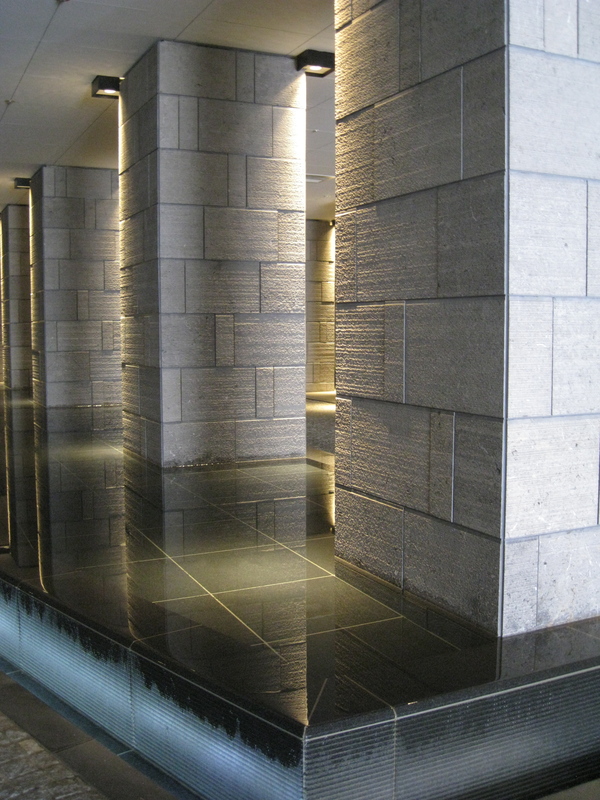 Upon entering my building, I noticed the water feature now had waves. Another aftershock. I came in our door. The first signs of damage. I filled the bath tub with water in case we needed it later. I opened the windows so they wouldn’t get jammed shut. The kids texted me that they were on the bus. I started to feel better. Spouse checked in. A few minutes later- the news sunk in, I got an email from her thanking me for saving her from the morning panic she would have endured trying to track us down. Currently public transportation is shut down. For some reason, unless there is an alien invasion, the airports remain open. Sensei is sitting in my living room because she can’t get home. Hopefully I can talk her into spending the night because the alternative is a 4 hour walk home. She’s so polite I might have to lock her in order to make her stay. Tsunamis now are wreaking havoc. The after shocks continue one after the other. Tonight I’ll feel better when the kids walk through the door. I’ll pray for those not as lucky. And give thanks for those who cared to do the same for us. This entry was posted in Moving to Japan, We're Being Shaken and Stirred in Japan and tagged Earthquake, Emily Cannell, Family, Humor, Japan, Moving, Offspring, Tokyo. Bookmark the permalink. All I can say is that you are an amazing woman..calm enough to write your blog! Love you guys..we need you all to come home in 1 piece! The truth is this- after an 8.9 earthquake, you go home, make sure you’ve got what you need, and WAIT. What else did I have to do? – And you maintained an engaging writing style, while producing information and sharing your experience… Very well done. I felt is if I were standing there alongside of you and the others. I lived in California for the aftershocks of the 1989 earthquake; things shook, beds vibrated, glasses tinkered and furniture swayed… you just stood still, held your breath and were relieved when it stopped. Nothing by comparison to this huge event in Japan. Glad you are okay! Thanks for your kind words Siklky! Wow. I’m really glad you’re okay and the kids are on the way home. I heard the news on the radio right when it happened (8 a.m. SA time) and thought of you immediately. I can’t believe you still have an internet connection! I know- I don’t understand how that all works- no cell, no phone, no electricity, but by damn, get me my Internet…. Girl, I knew you’d be fast!! I’ll be happy once Miss G is off the bus and home! Don’t hold your breath! It may be the middle of the night. OMG–sent you an email as soon as I heard. So glad you are okay. Get your kids and Spouse home! We love you and are praying for Japan! By the way, lunch in Lexington in July would be great–if we don’t get to Japan before then–ha, ha! We follow the disasters, of course. Can’t wait to meet up!! Got your email- thanks dear! I’m so glad you’re okay!!! That was a huge earthquake, the “aftershocks” are like normal earthquakes. Keeping you and your family in my thoughts and prayers. I hope your kids get home soon enough. Honestly I think we’ve had 20 aftershocks- now that the BIG one is over- I’m not even bothered. Dr. B’Hein and I get calls from the hospital in the middle of the night so it wasn’t that unusual to get a call. When I saw it was from you I was nervous. I did have my delayed freak out after turning on the news,……… and realizing in retrospect that you had your “Corporate Ouiser” voice on during the call. Little did I know you were gun-toting, sensei kidnapping (we know your keeping her so you have an interpreter), table top BBQue illegally fired up on the porch Tiger Mom in full on emergency mode. Naturally spouse was somewhere else, but the thought of a 6’4″ Caucasian man sprinting down the streets of Tokyo with arms flying akimbo, wild blue eyes and panicked look, may have been what finally ignited the panic in your calm Japanese brethren. Probably better he was elsewhere. Sweet Sensei, Now might be a good time to practice a calming Japanese tea ceremony. Interesting- only I think she’s the one that needs the calming. She’s been sitting with me for a while now. Our Thoughts and Prayers are with you all. I’m hoping all is still well for you based on your latest Blog. When I went to bed last night, I heard about the quake, but the severity of it was under reported. The news this morning tells a whole different story. We are thinking of you and hope you all are safe. HEY! Thanks and food to hear from you. Coming in July and of course the Offspring wants to hang at your crib. Will email later… If we’re still alive of course. I am so glad to hear that you and your family are okay–I hope your children have made it home safely by now. Best wishes and many prayers for all of you from Alabama. Aftermath- didn’t really think about that… Thanks Dana! Oh wow! I was just about to look up your e-mail to make sure you were okay, when I saw your post. You are amazing. My thoughts are with you and your family. Stay safe. the first post in my e-mail box was yours and I was so glad to find out that all of you are ok. Growing up in seismic area I know what earthquake can feel like, but never in my life I had experience 8.9. Be safe, my thoughts and prayers with all the people of Japan! You even write entertaining posts about earthquakes and tsunamis! I think I’d be too much in shock to write anything, let alone be able to write a detailed account. Good to hear you’re all okay. Thank God you all are alright…. I woke up this morning and turned on the news and then found out about the quake. I came in to try to send you an email and was so relieved to see this post saying you were OK. Please be safe…..sometimes the aftershocks can be pretty brutal themselves. I’m liking this post so that I can use the reblog feature. This is not to mean that I like the idea of yourself and your family being in the middle of a natural disaster. Thank you for writing such an honest account of how this has affected you. Now of Spouse could just wind his way home!!! He’s a tad more self reliant though! I am SO THANKFUL you and the family is okay! I have been glued to the TV all morning. We love you! Hey sweet girl! Thank you! Love you too! I’m glad to see that you and your family are okay. As soon as I saw the news of the earthquake I immediately thought of you guys and wanted to check in on you. I’ll keep you all in my prayers. Good luck out there. Glad to hear offspring are safe – will let A know. Scary scary. I was worried about you, glad everyone is ok. Do you mind if I post this on my facebook? I’ve only just met you, but I’m glad you and your family are all right. I thought about you last night when I heard about this. My prayers are going out to you, and to everyone who is suffering during this disaster. I so appreciate it! As the news goes on we learn more and more… And the after shocks just go on and on- weird. Reading this post sent shivers down my spine. And you describe all the events with your usual sense of humour and composure… Respect. Olga- I faked you out – the beautiful thing about blogging is that I can write whatever I want my reaction to be- not that I crawled home crying like a baby!!! You so did not, that I know about you!!!! Now you may have crawled home, working out your 5 point action plan!!! Hahahah!!! You keep me honest – and Lauhing hysterically about the action plan! Oh girl. Woke up this morning to see the news and confused my fiance with wild mumblings about blog girl! and family! and Japan! So so glad to hear you are ok, and we (I explained to him who and where you are) will be sending calm and safe thoughts your way! Thanks dear- good news is some of us are home now- albeit 8 hours after leaving school – we’ll see how the rest unfolds… You’re so sweet to check in- thanks! Glad to see that you’re all right. I’ve been running about checking on all my friends over there and it seems to have been quite the horror. My Japanese friends (in Japan) got quiet and couldn’t really talk about it- that’s how scary it was for them. Just checking in–glad to see the kids made it home–8 hours!!!!!!!!!!!!!! Just took dogs to the vet for travel documents. Movers are everywhere–life being boxed up and moved on to. . . ????????????????????? Thanks for checking in- I know you’re a tad on the busy side right now. Getting a little worried about what the morning holds- will we be able to get groceries etc as all transportation was shut down yesterday and the horror stories from Kobe were terrible. After shocks are occurring about every 30 minutes- not sure how that’s impacting the trains- those aren’t up and running yet which will cripple the nation….so much to worry about right. We need Sara. I thought of you the second I woke up this morning and saw what had happened. I’m so glad to know everyone is fine. Hope you don’t get more aftershocks, they’re most unpleasant. I’ve experienced both earthquakes and hurricanes, not sure which is more dreadful or frightening. Glad you’re all safe! I can’t stop thinking about all the people dead or injured… Already so many victims! God bless you and Japan ! Thank you so much!! We mess the blessings! You’re a sweetheart! Thanks for keeping a head clear enough to let us know! Prayers! Thanks Lisa for the message! We’re all thinking about everyone in Japan right now. I hope everyone can be safe. Thanks for the report. Thank you for writing your story. I’m glad you’re ok. Thanks for the good vibe! Well done, for managing to keep calm and even keep the sense of humour through all this. Everyone is sending their prayers to Japan for those who didn’t make it, and to those who did. The world is watching, and I for one am so grateful that you had the composure to share your story. You’re braver than I’m sure I would be in your situation! Thanks Mikalee-when you come from a truly dysfunctional family- you learn to fake calmness in all situations!!! You have been Freshly Pressed, my dear!!!!!!!!!!!!!!!!!!!!!!!! I’m loving this for you!!!!!!!!!!!!!!!!!!!! My thoughts go out to you and yours as well as everybody who was affected by this catastrophe! Your site has reached the front page of WordPress, and I – a complete stranger living in Edinburgh [yes, Edinburgh Scotland] – have read your moving account of of the earthquake. Thank you for letting the virtual world know. I too pray for all who are caught up in the chaos and destruction in Japan. I heard of this. Nice descriptions! I could feel as if I was actually there! I was really terrified- about an hour afterward!! That is great you are ok and kids too. I hope you had a nice night and everything is ok. Thank you! The news coming in is not good- but we are safe- looks like a long recovery ahead! I hope so. I am looking forward news from you from Japan. Glad you and yours are okay. On the news here it looks really bad. Thanks for your perspective! You are FP! Congrats! Unfortunately it is bad… Thanks for your thoughts… We are glued to the news and hopin the trains start soon- all signs of returns to normalcy. Let’s send out prayers, love, and much needed strength for our brothers and sisters in Japan and other parts of the world that have been affected by the earthquake and tsunami. Let’s spend 2 minutes in silence and pray for them. May God be with them in their hour of need. May He comfort them and give them strength to get through this. I did my two minutes of silence just now and I hope you would too. Hannah- thanks for your wonderful prayer. Peace and prayers to you also for sharing in Japan’s hour of need. You are so brave. In Pakistan we had a terrible earthquake in 2005. I live in Islamabad which quakes a lot. I freak out ALWAYS. Sometimes I’m afraid to shower because I keep thinking it will catch me when I’m helpless and well, naked. Running down questionably constructed stairs (I live on the fourth floor) of a questionably constructed apartment building buck naked isn’t a pleasant thought. My mother and I have been feeling ill watching the news. I’m too frightened to sleep thinking about it. I think earthquakes scare me more than anything. Anyway, I really enjoyed the humor and I am humbled by your courage (and humor) in the face of a natural disaster of such magnitude. Respect to you. I hope you and your family remain safe. My heart goes out to Japan right now. Offspring #2 shares your fear. She is now putting all of her clothes in the bathroom in case she has to run out only wrapped in a towel. Peace to you- we are all scared no matter who big or small the earthquake. If we weren’t, there would be something wrong right? Thanks for your thoughts! Holy Moses, to have such perspective in the midst of such trauma! I’m wowed. Kudos to you for retaining something that feels like “upbeat” as you recount this terrible day; I’ll not soon forget the tomato sauce on the hands line, that’s for sure. Very vivid. Take care, and don’t hop into the potential drinking water just because you feel a little dusty. Very funny- I’d still make the kids drink it. Yes- and determination. Thanks for your encouragement Aartsense. Goodness. I’m glad you’re ok. When I heard about the Quake this morning I immediately thought of you. I know don’t really comment, but I LOVE your blog! Hopefully everyone will be home soon and you can stop worrying about that end of things soon. Thanks for sharing…I enjoyed reading, despite the circumstances. Your worry about your children and loved ones reverberated with every moment that you recounted as you took us from the first movement to the aftershocks. God bless your family during this time, as you rise from it all. Thanks for your encouraging words SomerEmpress. I appreciate and cherish them. I’m so glad you and your family are ok! I’ve never seen anything so devastating! You’re account really puts it in perspective from an eye witness point of view! Thanks for the personal account on a truly tragic event as it unfolds. Stay safe and thank you for sharing. Thanks for your comments and well wishes Ed. It must have been an effort to focus and write this. I want to thank you for this. I read every word – not so much because I wanted to hear about the earthquake but because it takes a special person to post this. Thanks John- Really it gave me something to focus on while I waited for the kids to get off the school bus. The worst part was having the family spread all over the country with no control. My prayers go out to them… I am so glad that you are safe right now. Just horrified at what is happening. It’s getting more sad by the minute…. Thanks for your prayers. Glad your okay. I’m in America and have been watching news from six A.M. till six at night. I even managed to get it on at school. We are praying for everyone and hopin you are all okay. Our thoughts are with you. I agree with what many say. This is a time when we all need to pull together to get everyone help. Hope everything is okay. As good as it can be. We’ll keep praying and hoping. Thanks for your prayers and well wishes! Keep them coming! Thank God. Korean Peninsula does not have ” Earthquake and Tsunami” like Japan. I have been living here for 35 years. No Earthquake or Tsunami. Only Threat we have similar to Earthquake is threat from North. Hahahah!! There are issues everywhere right! Thanks for reading! Sad to hear this shaking news. Wish all the best of luck!! Thanks- never thought I’d be writing a first hand account of a 8.9 earthquake! Wow! Great post. 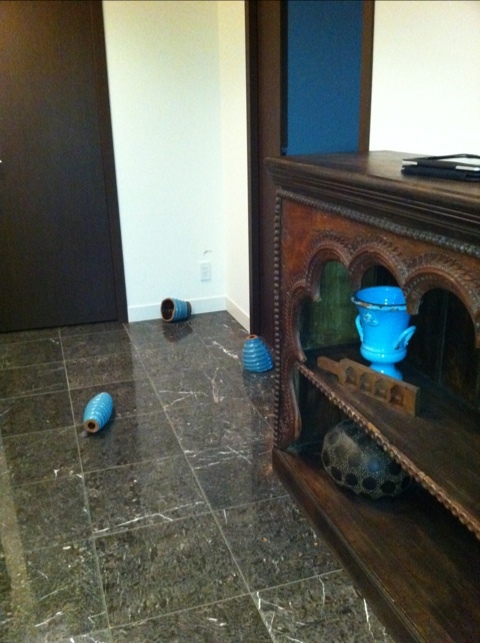 I was in the Northridge quake in Cal. in 94 but nothing like the one you just went through. I can’t imagine it lasting from 3-5 minutes!! It’s such a horrible feeling that you never forget. So glad to hear your family is okay. I think they ALL feel like they last forever!!! Thanks for reading! Like liza coatez found ur blog from frontpage of wp. U described it as we can really imagine what u were going through. Permission to share this link.. Tx. It was the biggest recorded earthquake in Japan’s history. Hey, what a terrifying experience we all had yesterday, but so so sad for the people who have lost their lives in Sendai and neighbouring prefectures, horrific news reports on the Japanese channels. Thank you for making me smile through your posting, being positive has to be the most wonderful gift, love the part about the shopping cart! Happy now that my daughter is home this morning (Saturday) she had to spend the night in Yokohama where she attends school, no way of getting her home last night, thanks to very kind neighbouring parents, she was safe with friends. Be safe everyone in Japan, I am not a religious person, but my goodness I prayed yesterday and will continue to do so! I’m so glad she is safe an that y’all are fine. Mine left school at 3:30 and got home at 11:30. Long day for everyone! But we are so thankful!!! Great reading. Glad to see your house held up pretty good. I can’t even imagine going through all that. And worrying about your family and where your kids are. Just a few more grey hairs today for you. Now looking forward to getting back to normal and emptying the bathtubs! Reading your post gave me the eyes on what had happened in Japan yesterday. Thank goodness you and your family are safe. it’s amazing to see your positive outlook in your account of the earthquake, and I’m happy for you that both you and your family are safe and that you’re well-equipped with emergency procedures. stay safe. Obese so glad I actually followed through for once and got everything we needed! i guess one can never be too ready!this, coming from someone who refuses to buy travel insurance, all the time. I guess when you live with alligators you check the water right? I hope your friend is ok- I’ll keep him in my prayers! The things some people do to get Freshly Pressed . . . 😉 Congratulations – great post from the front lines! On a serious note: I have been watching events unfold with great sadness for the Japanese people. Devastation and loss of life on that scale is absolutely heartbreaking. It’s just horrific…. Around me life has returned to a fairly normal state but we are getting earthquake warnings now- which I didn’t know there was a such thing. Apparently it’s more like a tornado warning- buzz on the tv and about a minute later it hits… Anyway- thank you! Leave it to me to get a fresh press for laughing during an inappropriate time… Some things never change. Oh my God.. I am glad to know u are safe and ok there. Btw, amazing described. Really, it likes i felt what u are feeling that time. And when the tsunami was happening, here in Indonesia, it was raining and the wind was very big. I do not how to describe it, but i think it wasn’t as awful as u felt. Permission to share this link, and God bless u, God bless us. We all have different reactions I think right? But we all care for others when we see it happen to them too. Of course you can share… Thanks. Thank you for telling us first hand what you are experiencing. We pray for you and your family and hope that you all are well. Stay strong! Thanks for your encouragement! I appreciate your words. Thanks for this. I was in Yamanashi when this happened and didn’t get nearly as close the full brunt of it as you did and the folks in Sendai. Stay safe and I hope you find your family. Thanks- glad you’re ok too! All are fine and accounted for! And now driving me nuts…. We have all been worrying about the people who are there in Japan and praying for the best reports. So glad your children finally got home. That would be my worst fear that something would happen to my children. Thanks for your blog update as we are all wanting news of what is happening. Relief efforts are already underway by a number of large companies and should be in place very soon. So glad a romance author sent me this link. I feel closer to all of you. I have always wanted to go visit Japan but at my age don’t think I will make it. Such a beautiful country. We will continue our prayers for each and every one there. Thank you- it is so sad to see the tsunami wash away the houses and country. I just read the coast line got moved by 8 feet. I was watching the news yesterday and immediately thought of my friend who is studying in Japan. I was able to chat with her online, she said she was safe but it was really scary. My sister’s friend got stuck on the train then during the earthquake, she said it felt like the train was going to be derailed anytime. She just got home this morning. It’s a good thing you had internet connection then. It does help to get ready the things you need even in the midst of the emergency situation like this, I admire you for what you did. Thanks for the post. Praying for the best for the people there. Ugh- the train was probably one of the WORST places to be! Poor thing… I’m glad she is home safe! I’m glad you and your family are together and fine. Your responses are admirable in such a dire situation. Very few have been through an 8.9 earthquake and survived. I wish you the best. It did make good writing. Thanks Rubie – I am glad to still be here! Your inner strength is extraordinary. We are all blessed to be able to witness you and our fellow human beings as you move through this event and onwards with your lives. May your children and husband now be home with you and safe. May your wry sense of humour never desert you and may you come through this as the guiding light you are to those of us who witness you. Thank you for your frank, no nonsense and grounded witness account of one of the scariest things that can happen to us. Thank you for your affirmations of faith! Loved them and needed them!! Tomorrow I will post the Offspring’s reactions…. praying for Japan victims, have faith in almighty. he will save us from this disaster!! Don’t lose hope Japan, we all are with you. I stumbled upon this from the wordpress home page. I hope all is well. Stay strong!! Even though the PM is saying to be calm, its hard in this kind of situation.. Very much so..The nuclear plant situation too :(. I’m glad that your family is okay. I’ve been stuck to the japanese & english broadcasts since its all happened. @_@ It breaks my heart watching, but I can’t pull away. I missed something in my life. I have not been in an 8.9 magnitude quake in all my life. 6.5 was my worst experience. The tsunami was awesome. I’ve never been in one. They are very powerful. True. New here and grateful for the read and all of the comments. I would much rather get news this way. We formed a meditation and ongoing prayers sending megatons of imaginary light, but real in the sense of focused good thoughts to your zone of living. Thank you for being so talented. Thank you for those beautiful mediations, prayers and affirmations Kathy. I just wrote about our experience too…not as funny as yours…. That nuclear thang just ain’t a barrel o laughs…. It is good to hear that some individuals and there families managed to make it thru this disaster. Hopefully with the world community, the US and Japanese goverment stepping up all will turn out well for the Japanese people. Will try and stop back and check your blog out. Good Luck and best wishes go out to you and your family in this troubling time. Thank you so much. The nuclear power plant is currently melting down. US government sending planes overhead with coolant. Black out at 6:00 to conserve power and attempt to ease situation…. Glad to hear your family is fine. My prayers are with Japan. God bless. my prayers for Japan and its people. God bless! Thanks! The Nuclear Power Plant is currently melting down- keep praying! To be honest, I did not read through the whole post. Even if I would all that I would say anyway would be that all of you up there in Japan should take care. You have prayers from me and I bet millions of other people all around the world. hi. popping in from London to say that our thoughts and prayers are with everyone in japan. It has been terrifying just watching the news footage, that I can’t even begin to imagine how you all must be feeling. Glad that you are safe (even though I dont actually know you), I am glad anyway. Thanks for a lovely post. I can see from the comments above that your family and friends are relieved to know you are all ok.
Now we all have our eyes glued on the Nuclear plants… Thanks for your thoughts and concern!! I found your blog yesterday from the wordpress freshly pressed page. I am a fellow blogger in the UK. Your account of your experience of the earthquake is simply the best piece of writing I have read in any blog ever. Well done you are one of lifes natural journalists. It was a very live description which made me feel like I could have been there myself — although I am mighty glad I wasn’t. My son and I are due to visit Japan for the first time in April. He was in New York in 2001 and flew back to the UK the day before 9/11. He must be aprehensive about this forthcoming trip so we will both follow you blog with interest in the next few weeks. John- thanks for your kind words! You and your son will love Japan. I have family coming in – I HOPE- on Friday and will be posting what I hope to be the ultimate itinerary this week of Tokyo and Kyoto so stay tuned- where are y’all headed when you get here? Thank you so much for your blog entry amblerangel. Everyone around the world appreciates it more than you realize. If you can please update us. Your blog is a form of relief amidst the news of devastation. Thank you again. I was struck by the silence you described on the street after the quake. I would have imagined complete chaos and people screaming and crying. Glad you and your family are okay, and I hope that Earth is kind to Japan in the coming days. It was so eerie- all I heard was the creaking of the buildings- other than that Nothing. No traffic noise, no talking, no crying- nothing- everyone listening for the buildings to fall. All of us were eyes and ears- looking and listening- what was going to fall on us and what noise could alert us as to where it was coming from. I think if anyone talked they would’ve been shushed. Wow… what an experience about BIG earthquake in Japan you have there. You’re not CNN, but the way you describe the situation is like a life experience reporter. Our prayer for you and all people in Japan. Thanks for the prayers and for tuning in! So pleased to hear you are all OK. While lying in a darkened room (migraine) I heard the news and thought of you, as well as all the people concerned. I could not write before but having been sending you mental good wishes all through. Great sympathies to all people and animals involved in such a huge disaster. Thanks so much for your well considered and brave blog, it means so much more to hear from someone on the ground that news programmes. Take care and good luck in the coming weeks. Thank you dear Sweffling. I’m sorry you’re suffering now. I get migraines and know how debilitating they are. Did you get your dog? Take care! Praying for Japan! Thanks for posting your experience. One can only imagine the thoughts going through your heads as you experienced this terrible disaster. Watching CNN and keeping up on all the latest. Stay safe and know that there are many people here in the states holding everyone in prayer!! The Tourist wants you to get on the first jet out of Japan. We can put the kids in the tree house and you and husband in my office. I might retire my Tourist title to “Widespread Panic”. I love you and have tried skype a few times and its not going through. Give us an update somewhere if you can. The Nose was the point person on the Emergency Communication Plan but apparently when she got my phone call she turned on the news, then went back to bed- and FORGOT to do her job- call everyone and tell them we were ok!! Is the outhouse still working? i’m a new blogger..when i heard the news, i was really shock, never thought it will happen again..hope you n your family will be safe…take care.. So relieved to hear that you and yours are safe and sound. Take care, sending positive thoughts your way. Hey Bob- thanks for checking in. On our way out to Edmonton in July…. Better not be cold. It’s been a hard day on the Planet. Peace. Thanks for the affirmation- peace to you as well. Wow, that sounds crazy. As much as I hate the cold I must admit there are certain advantages to living in the northeastern United States, such as no earthquakes. Good to hear that you are safe. Wow, I haven’t heard that yet. Our Earth is an amazingly scary planet. I came cross your story through Freshly Pressed. The experience you described standing out in the street gave me goosebumps. Stories like this make me realize how lucky I really am and how the day-to-day complaints I have really do not mean anything in the grand scope of the world. Isn’t that just AMAZING??? Thanks so much for your well wishes! Sounds terrible. I’m glad you and your family are ok and hope that the after shocks stop and people can start rebuilding. I found your blog on the front page of Word Press. The 25 yr old man was swept away was in Crescent City, CA. He was a new resident, trying to get his life together after getting clean (from drugs). His body has not been found. Another tragedy, sigh. I really don’t have words to express the heart-sickness I feel, but know I am grateful to read of your personal miracle of escaping the man-made land with two others! Also grateful to read of your family eventually making it home safe. My thoughts and prayers are with you and all those trying to survive in Japan now. So sad- the stories are just heartbreaking. The extent of it is hard to get my mind around. Best wishes for smoother sailing from here on. Seeing this post made me instantly relieved. I’m glad everyone’s ok and wish you good luck with the aftermath. Hey there- thanks for checking in on us! wow. first hand encounter. I hope you and your family are safe. I’m amazed that you know what to pack for emergency (something I should learn from now on, cause you never know). This post is incredible helpful for us all to deal with this new explosion of news about yet another natural disaster striking. This year has already been so full of catastrophic events of apocalyptic dimensions that it’s good to hear/read some level-headed, even humorous words about it all. Thank you for sharing and all the best to you and your family, and everybody in Japan ! My thoughts are with you and your family. Take care. Thanks Workingtechmom- love your blog! Thank goodness you’re all right. It sounds like you’ve been through so much. While I’m not religious, I suppose a religion would be most comforting to have as you go through this. In any case, you are very fortunate to have your family safe at the moment. Please keep us updated. I have friends who are on one of the bases in Japan. Fortunately they are doing fine, but my thoughts and prayers go out to the others who have been affected. Mother Nature is unforgiving; very sad. SO good to know the bases are here- the first place we go if it really gets bad is the embassy or the base. natural disasters are so scary. and whats scarier is tghat we cannot prevent them. 😦 congrats on FP! Good to hear that you are relatively safe and sound with the billy lids. One the news the situation looked really scary and I feel for all those involved. Good luck for the future and please keep your sence of humour! Well- I’m known for an obnoxious laugh- I think the Japanese knew when I arrived because they heard it. Thanks for the well wishes! Watching the news makes you so sad….such a disaster…those poor people. I have been thru 2 hurricanes, I live in a region with tornadoes… I hate the sirenes screaming at night….some were not far from my home….but I can only imagine how scare everyone must be everywhere in Japan. My prayers and thoughts are with all of you. I think about my daughter during the hurricane Opal..(a Medic in that time).her courage saving people in the midlle of that hurricane. etc. working over 48 h non-stop, finding drowned persons etc… . Courage happens in a moment without thinking……..but after you realize ….oh! my, this is terrible…I am alive! etc… thoughts are all mixed up when you are underfire, you do things you might never do again…a mother think about her children, her spouse, but not herself. After when everything is done.. this is the time to rest, cry and think. Japan will need all of us to go back to some “normal” in the future…. I have a nephew in Thailand (few years back survive the Tsunami there also). Just left the area half hour before it started… just behind him… Thinking about all of you in Japan.. (my husband stayed there 4 years (Military) and loved it… ). Stay safe, warm, calm, Bless all of you……. Hi Therese- Like you- I’m more used to hurricanes and tornadoes. I feel so sorry for all the families of the missing and the dead. As I write this my building is starting to sway… Thanks for your prayers. As a songwriter, I really appreciated your writing style, you took us on the journey with you. I’ve been to Japan probably around 20 times although never lived there. I can appreciate what it is like when you don’t speak Japanese although in a situation like this I think the experience probably transcends language. I’ve experienced lots of swaying buildings, but again nothing like this. I can relate to your husband too, I was usually in Japan or other countries when there were crises at home. Anyway, wishing you and yours all the best in these shocking times. Thanks so much Luigi- I appreciate the time you took to write… Peace to you. I hope everything goes good for you and your family and friends. I am sorry for the earthquake. I am afraid to say this, but I do not know how tragic and horrible the earthquake must have been. The reason for this is because I live in America, where I have never been in a massive earthquake or in any other nature destruction. The pictures from Japan do scare me. I get a feeling of fright and worry because I do not know if my city might be hit. I do hope that Japan will be build back up again and get back on track. The world needs Japan. Ah, another blogger in Japan. I’ve been checking in with many bloggers in Japan, including a couple in Sendai. One has let people know he’s ok, the other doesn’t seem to be checking in on his blog. Glad to know you’re ok, but I think I knew that, since you’re in Tokyo. I’m in Fujisawa, and nothing major here. I was stuck at work all day on Friday with no way to get home, unless I walked or waited the 2-3 hours for a taxi. Trains started after 9pm, so I could go home that way. Was quite the day, wasn’t it? That it was! Glad you’re ok. Tokyo seemed to be fine other than a few fires. Also glad you made it home from work! I bet you were tired Sat. Pretty tired, yes. My girlfriend walked home. It took her 5 hours, and she was exhausted and very sore. I’m glad I have the day off tomorrow, but back to work on Tuesday, I assume. Praying for Japan and all affected countries. I can’t help but cry as I watch the footage of cities being demolished. God bless you, your family and the people of Japan. Wish there was something we could do to help everyone. Please stay safe and keep us informed when you can. Hugs to you and your family. Are you still alive? You have not posted any of my comments. My family and I we live in Montpelier, Vermont. Who is Miss Hathoway? I notice that it has an ‘O’ in the middle of it. What is going on? Why are they saying that thousands of people are dead, but that they have only identified 565 of them? Are you there? She was the secretary in the tv series from the 60’s “The Beverly Hillbillies” The main family was the Clampitts where I took our name. I just want to hear that your children made it in the door okay. Can you please respond to that? All a-ok- thanks for asking! Okay, it looks like you are on here commenting now, but I am confused, because it says that you are posting at 1:35am which is what time it is here. I highly doubt that we are in the same time zone so I am really confused. Just post something that I write. Is Japan a communist country? In a way is it good that the nuclear plants are being detroyed by the quake? Did the US even know that you had nuclear plants up until this point? That is sad about the reporter that was clicking pictures and got swept away. Glad to read you and your family are safe… My heart goes out to all who lost someone in the devastation. Thanks for your update and Congrats on being Freshly Pressed. I came across your blog on the front page of WordPress (I’m showing my daughter the site as she is off to Peru on Thursday and wants to record her experiences as a volunteer for three months). We live in Canterbury, New Zealand, and have experienced two recent major earthquakes, a 7.1 last September (with no loss of life), and a 6.3 on 22 Feb (with loss of life), with many, many large aftershocks – for you to go through a 9 would have been absolutely terrifying, I can really empathise. But to also have a catastrophic tsunami, and the nuclear plant being of major concern… All the best to you and your family and friends during this very worrying time. Thanks for your comments. I know you know how we feel. We have heard of your loss as well and the tremendous loss of life. Prayers and peace to you. Great to be reading this. Thank you for posting. It’s been terrifying being away from home, and trying to get a hold of my family in Tokyo. Try Skype if you haven’t already. Tokyo fared much better than the rest of Japan. I’ll pray for you and your family. Wow, what an account. Glad that you and your family are ok. I know the feeling of not knowing where the family is. I have recently experienced the Christchurch earthquakes (over 5000 since September). The silence you described is someting I also remember from our most recent big quake and is one of the things I will never forget. Stay safe and ride those monsters through. My heart goes out to you and all of those in Japan suffering and uncertain. There is a light at the end of the tunnel although it may seem like a really long way away at the moment. Thanks for your comments. I know you know exactly how I feel! Our prayers are with ya’ll also. I’m imagining it when I was reading it. Are you preparing to move? How’s it going there now? No- we’re staying put! Now we’re just watching the power plant- many after shocks. But public transport back up and things in Tokyo returning to normal. I am glad that a lot of people are safe there (like my uni friend who worked in Tokyo). Hope you would overcome the difficulties in the coming days. –Msg from China. Thanks you for your well wishes!! It was something to read about the quake from the experience of someone who went through it. So glad you and your family are safe. It has been horribly shocking and painful to watch all the devastation on TV. The power of the tsunami sweeping away everything in its path was unbelievable. Thinking about those in its path who were swept off or who saw it coming and could do nothing was extremely distressing. I am glad you were freshly pressed so I could find your post on logging in. Is there any danger to you’ll from the power plants? We’re watching that very closely and it’s still uncertain. Our bags are packed by the door in case we have to evacuate. Right now, fingers crossed, things seem to be under control. I appreciate the details you included in your account of the earthquake. All we hear about is what the news shares. Your presonal story was interesting to read and gave me a better picture of what it is really like to experience an earthquake. I cannot imagine what you’re all going through and will continue to keep everyone in my prayers. Thanks for you comments! And prayers! Hello, at times, you watch bad news and you think it is an exaggeration, the media preying on our hearts, just keeping the tabs high, and still, sometimes, until we go through some of these things, we don’t quite grasp just how bad it is, everything that the said media missed out, … i can barely imagine the magnitude of uncertainty that gripped you in those moments, but you express it so vividly, i could imagine myself there. Here is to sending you many prayers and wishing you and everyone safety and courage. I hope the next days are easier to handle, and you all get through unscathed. Thanks for your prayers- we still need them. More aftershocks predicted at magnitude 7…. Thanks Rohit the Kid- so far so good…. Thank you for your thoughts and prayers Getagirl. hey i m a pakistani and i respect japan very much and my some friends are in japan and i have lost conntect with them i m praying very much that the god have to save you guys and the whole wrold have to support japan to stand again with the world and i love tokoyo is it safe ? Right now I feel very safe in Tokyo- just waiting to hear about that nuclear plant which does make me extremely nervous but early signs indicate the situation is improving. Hang in there…I’ll say prayers for your friends. Glad your family is safe. It is so amazing you thought about all the steps to take. Everyone effected by this is my family’s thoughts. In your sea of comments here is one telling you that I am happy you are okay—what a scary thing this would be to go through. Stay safe. It’s amazing to me to see that we just went through a 9.0 earthquake and Tokyo isn’t on the ground. Now I’m not so afraid of big earthquakes- here. What a difference technology and a strong economy makes. (Well- when many of these buildings were built) The tsunami damage is a whole different ball game. Glad you are OK and able to get news out about your experience. I have been glued to the TV since I got up Fri. AM, during school (HS teacher in MI) and as soon as I got home. Husband doesn’t get why I must watch the news non-stop. It is history. And, I lived in Japan before I knew him. Lived in Ibaraki-ken for two years as a JET Programme member oh, almost 20 years ago, 2nd year of the program. Not in touch with the people I used to know but worried that they are OK and no way to reach them. There was no internet, laptop or cell phones, etc., when I lived there. Still have great fondness for the country and her people and praying that she does NOT endure a nuclear catastrophe. My sister has a blog through WordPress and that’s how I managed to find your story. Stay well, Gonbatte’ kudasai. AHH- thank you- what is her blog address? What a difference the technology makes. I marvel at the ExPAt experience now vs even 10 years ago. Things I miss about Japan are easy access to sushi and other yummy foods. Not so easy where I now live in MI, as compared to life in Chicago, where I used to live. Congratulations on being FP! I know now how great that is. If nothing else, at this tenuous time, you have access to comments from others around the world who want to know firsthand what’s going on in Japan. It’s so nice to know how many people from all over the world care and are concerned. A great perspective from the inside. Thanks for sharing and glad you and your family are Ok.
Hey Ava- hope all is well with you- thanks for checking in. Prayers are with you and family. Prayers are definitely needed! Thanks.. Thoughts and prayers are with Japan and their familes. Interesting to read an earthquake report from the view of an english speaking person in the middle of the action. I don’t know you, but I’m glad you and your family seem to be safe. And my utmost respect for you staying so calm! I respect you for your calm response to the earth quake. I pray that you will be able to help others with your calm and effective wisdom and quick thinking. Thanks Carla for your kind words. I’m not sure I was really calm!! Signed on to check on my blog and saw your page featured on the wall. Loved your writing style and the ability to hear a regular person’s account of what happened. Watching CNN can only give me a glimpse of what is going on. I can only imagine how things are for everyone. I look forward to seeing that things work out to be ok for you and your family and you are hopefully reunited by now. All together and duking it out like old times! Thanks for your nice words! Are you moving back to the US? Great to hear a first person’s account on this scenario. Sometimes just reading some news article doesn’t feel as real as from a personal account. Too bad this is the sad reality but I am glad you and your family are alright. Personal brings it closer to home….Thanks for your kind words. Thanks Maxgames for the prayers for Japan. They are still needed! Very glad you and your family are safe. Definitely sending thoughts and prayers to everyone over there. Thanks for the prayers- keep them coming! I must say I admire your strength for posting this blog despite everything that happened. I couldn’t even fathom what an 8.9 earthquake could do, it must’ve been extremely frightening. Keep your strength alive for those who feel they’re losing it. Thanks Joseph- I feel now for the rescue workers, the nuclear plant workers, and all the loved ones who are helping, working, and looking. Sending warm thoughts and prayers from Paris. What you and your family, and all your Japanese counterparts, have survived is incredible. That you have come through this with your wit and wisdom intact is nothing short of miraculous. Thank you for sharing your world with us. Thank you for your warm words- it means so much! Kamisama will guide you all there in japan…. Thanks for this very good account of your experience of this tragic event. This makes it so much more personal. I’m glad you made it through with not too much damage and hope the nuclear threat doesn’t become worse. Wish you all the best for the upcoming weeks and months witnessing the recovery of this country. May I post the link to your article on my own blog and on facebook? On Friday I sat updating my blog, safe in my home in South Africa and yet totally shaken by the news. Isn’t that trivial – while I was shaken by the news you were shaken by the aftershocks. My thoughts are with you and all around you. For us in the south of Japan, we felt only a slight sway… and that alone did create a panic round here…. It was not the same up north, and things are swinging between bad and worse.. and the big ? looms over the nuclear reactors… My heart goes to all those who are amid the tensions.. and I join the million minds around the globe in prayers….. I agree Vipin- lots uncertain now. Thank you for the inside view – take best care. We send only good wishes to you and the whole of Japan as the rebuilding begins – what a devasating phenomenon. Strength and courage in the days ahead. True sign of a gifted writer. In crisis situations and challenges, you are able to pen. Thank God that your family and you are safe. Spouse might call it “expoitation”- I like yours better- thanks! wow, just realised your post made it into Freshly Pressed. Congrats, but more important than that, hope you and your family are keeping safe. Keep watching the news and cannot believe the amount of devastation, just dreadful. Thanks hon- we’re out for a little vacation now…. I am so glad for you that your family is intact and everyone was able to contact each other to let you know they were okay. As a mother myself, that would have been the hardest part for me, not knowing if my kids were okay. And, my goodness, how smart of you to think to fill the bathtub with water! And all the other measures you took. You are a true survivor and caretaker; aka, a great mom (as was shown in your trying to comfort the young grocery clerk). I will continue to pray for you and your fellow man there in Japan. I am going to tweet a link to your site, too, if that’s okay, because I know there are many of us here in the US that are concerned for all there. Yes- prayers- please! Thanks for your kind words and thoughts. Hope you’re all still safe. Praying for all of Japan. Found you ironically not through Freshly Pressed, but Tori Nelson. Thanks for sharing your story. I lived in the Bay Area in ’89 and experienced the Loma Prieta earthquake firsthand. That one was terrible, and it was “only” a 7.1. I can’t imagine an 8.9! Glad you and your family are okay. Thanks for reading- I LOVE Tori’s blog!!! Of course I’ve heard so much in the news, but hearing about it first hand from someone who experienced it is far more terrifying. Glad you’re okay, and my thoughts are with everyone over there. I can’t imagine being there when Japan shook. I was in California reading a book for school, when I got the urge to see what was being reported in the news at 4 in the morning. Sometimes I can’t sleep. I couldn’t believe it. It’s like Japan was in a blender, but the end result was an undrinkable smoothie. Glad to hear you are alive, and great advanced thinking on your part. I hope Sansei is okay. Good luck smoothing out the kinks from this experience. Thanks- you’re right- smoothing out the kinks will be the hard part…. Thank you so much for sharing. My wife and I have been praying for Japan and all those who were affected by this terrible earthquake and Tsunami! It must have been extremely hard, but it sounds like you are surviving. Thanks for sharing! Thanks for your prayers Jim…and your wife too..
Japan doesn’t deserve this…well, any country deserve it!! You are very brave, hours later since the earthquake passed you are here posting. Amazing! With reason you got freshly pressed!! I want to encourage you, keep surviving. Hopefully the worst has already passed. How many people on Earth can fully imagine suddenly loosing your home and everything you own, perhaps family members too, and then you are out in the open, without shelter, without light at night, water, or food, the temperature somewhere near zero, and all around you the dreadful quiet death of destruction; and others like you, in deep shock, wandering, lost, in the dark night of the soul between star-lit unresponsive heavens,…. and hell. What a fantastic nation, to absorb in such manner, such a wicked stroke of fate. As with all the world, my thoughts are with you and the people of Japan. Be safe. Hold tight to your family. This disaster is really so massive and unexpected. Life is really so fragile and can be gone just like that. You guys are goin really good! Keep the good work up. Are you interested in Technology? go to this informative website! I was watching CNN footage of everything that happened, but I must admit that your first-hand account gave me the chills. Living in Los Angeles, I’ve experienced some minor-major earthquakes, but certainly nothing like that. It’s good to hear you had preparedness classes and kept your wits about you. I’m also glad to hear your family was okay and you were able to get in touch with loved ones. We’re all thinking of you over here! I dont think making jokes and having fun at this time of severe pain and suffering, death and destruction and possible nuclear meltdown that will affect the world, is appropriate……….. Thinking about and praying for Japan this morning. Thanks so much for your prayers fashion widget! My cousin lives in Tokyo and I have been watching this earthquake and its devastation unfold with nervousness and praying for all those effected. My partner and I were in Chile last year when the earthquake hit and it sends shivers down my spine taking me back to that very surreal moment when the earth shook and all I remember is an eerie silence, as if someone had muted noise altogether. I know. I know. Thanks for commenting – thanks so much for the prayers. Are you okay? I hear that the nuclear power plant exploded and that there was an evacuation order. It is just so surreal seeing pictures of cars piled up like holocaust bodies, a big boat on top of a little house, a car on top of a house… Please write back. Thanks for your concern- all is well. We are out and vacationing until the kids have to go back after Spring Break. No worries! Remarkable post!! I have read this a couple of times for the last few days, while watching the heartbreaking devastation of the country on CNN. Truly appreciate the way you have kept optimism and hope alive in such trying times. Do take care. Hope things would start becoming normal soon. Would like to put the link to this page on my blog, with your permission. Absolutely- and thanks for reading! Keep writing. This stuff is great! Thanks for sending along your song. It was so nice of you to write it…. I report for a visibility of the silent face of God, of the Holy Spirit, or is it only the countenance of an angel? It ist permanent visible since 1976, and others can see it too, and ~ 45 others have seen it (but of course they can not distinguish, if I made a fake). Shibuya is about the last place I would want to have been during this quake…too many people! Are you still in Japan now? Yep- still here! I was actually more comfortable here than in say – California- because most of the buildings are newer and you know how strict the earthquake code is here. I would not want to be in California for any size earthquake. I don`t know about you but now unless it`s over about 7 we don`t even stop what we`re doing.